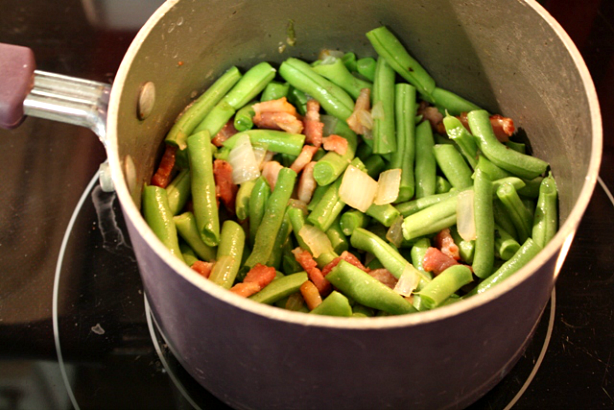 An old fashioned down home green beans side dish, cooked with new potatoes, bacon, onions, chicken broth and seasonings. Good old fashioned southern comfort food, it doesn't get much better than that!!!! 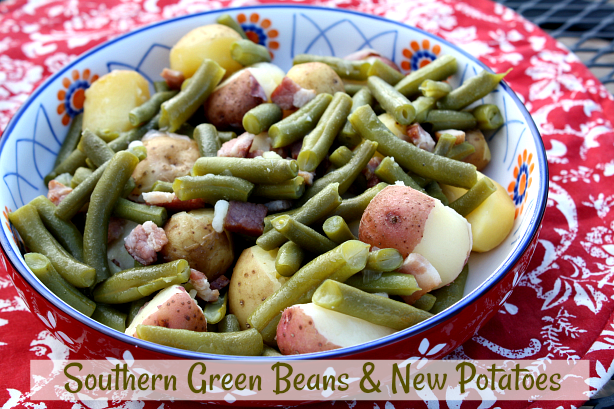 If you're looking for a down home vegetable side dish then you must these Southern Style Green Beans & New Potatoes. 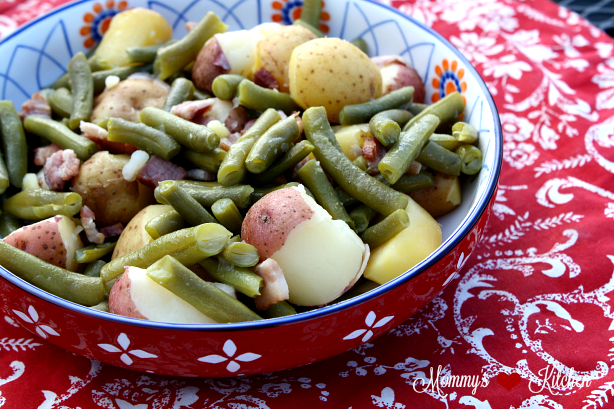 When I think of a green bean side dish this recipe immediately comes to mind. I'm lucky that I have fresh bush beans and potatoes growing in our garden throughout the summer, so I can enjoy this dish anytime of the year. 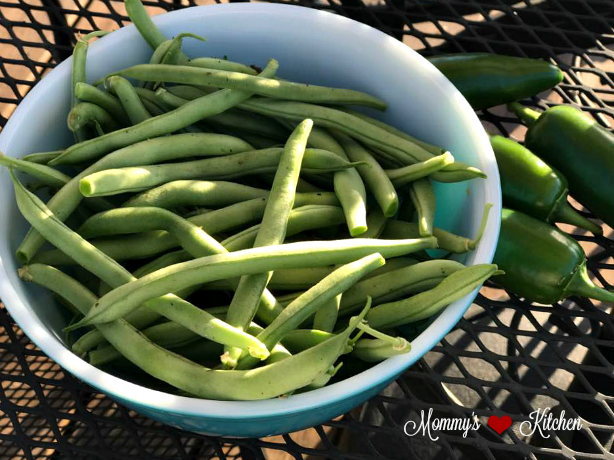 If you do not have a vegetable garden fresh green beans from the grocery store or farmers market are just as good. They say bacon makes everything better!!! Well it's true and the bacon flavor really comes through in this dish. 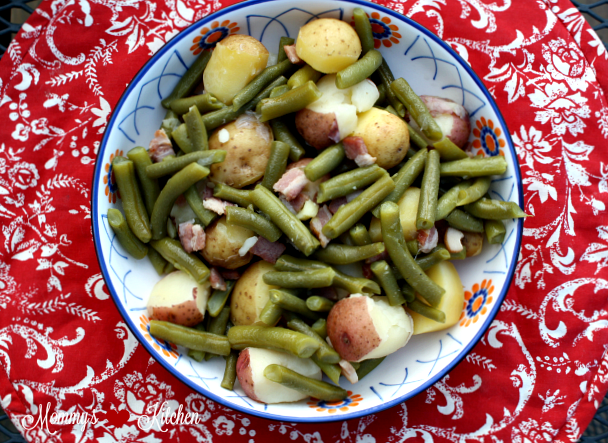 Green beans and new potatoes is really simple to prepare and only calls for a few ingredients, fresh green beans, new potatoes, onions, bacon, water and chicken bouillon. That's all you need to make this delicious dish., so let's get started. First wash the green beans under cold water and snap off the end and then snap the beans in half. Place in a bowl and set aside. 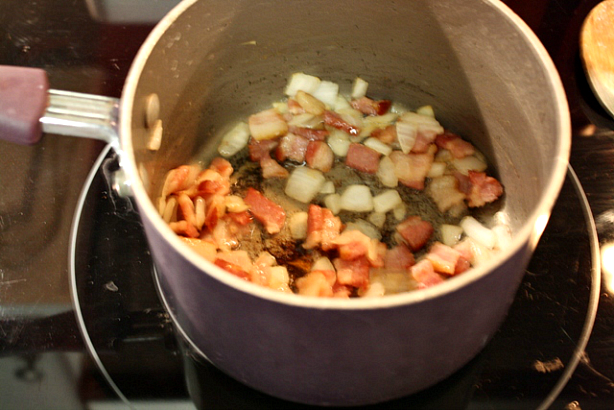 In a large saucepan or medium or medium pot, cook the copped bacon over medium heat until it has rendered most of its fat and begins to brown. Add the chopped onion and saute until translucent, about 5 minutes. enough water to cover the beans. Add one chicken bouillon cube (I used Knorr), garlic powder and salt and pepper to taste. Peel off a center strip of skin off each new potato. Add the potatoes to the green bean mixture. Bring the beans to a boil, reduce heat to low, cover and simmer until the beans and potatoes are tender (about 30-40 minutes). When the green beans and potatoes are cooked through, remove from heat and transfer to a a serving bowl. Add additional salt and pepper if needed. Wash the green beans under cold water and snap off the end and then snap the beans in half. Place the snapped beans in a bowl and set aside. In a medium or large saucepan (depending on how much beans you are cooking), cook the copped bacon over medium heat until it has rendered most of its fat and begins to brown. Add the chopped onion and saute until translucent, about 5 minutes. 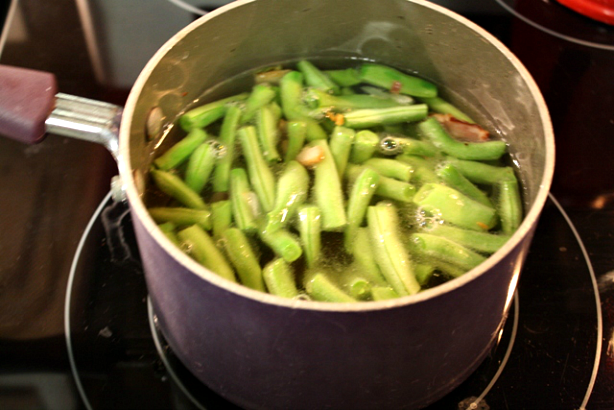 Add the cut green beans and enough water to cover the beans. Add one chicken bouillon cube (I use Knorr), garlic powder and salt and pepper to taste. Using a knife or vegetable peeler, peel off a center strip of skin off each new potato. Add the potatoes to the green bean mixture. Bring the beans to a boil, reduce heat to low, cover and simmer until the beans and potatoes are tender (about 30-40 minutes). When the green beans and potatoes are cooked through, remove from heat and transfer the mixture to a a serving bowl. Add additional salt and pepper if needed before serving. This sounds delicious can't wait to try it. I don't have Paula Deen's what else can I use? I have mostly Pampered Chef seasoning . Her house seasoning can be made at home. 1Mix ingredients together and store in an airtight container for up to 6 months. My mother & grandmother both used to cook this way, and I made the mistake of not getting recipes (or hanging out in the kitchen) while gramma was still with us and my mom was in good enough health to share her recipes. The only one I managed to get before it was too late was Gramma's Veggie Soup. So thank you for giving me a clue how to do this kind of comfort food. I can't wait to try some of these recipes. Now I just need old fashioned, buttery potato soup, fried potatoes, fried green tomatoes,and country fried steak. BUT I am guessing that if I keep looking I will find them all right here. Thanks again! THANK YOU, THANK YOU, THANK YOU! for that wonderful String bean receipe. I cooked it for Christmas dinner and my husband and children, couldn't get enough of it! I was amazed myself, it had so much rich flavor, mine never..ever came out like that!!! I cook mines just the same. I just add a little sugar. my family and friends love it. This is pretty much how my Mom and my great grandmother made green beans and potatoes. The only difference is that they didn't add onions. I make mine like they did. I love lots of black pepper with mine. Ahh, the wonderful southern string beans! My grandmother lived in Darlington SC, and this is how she did her beans. The absolute best!! I too think of this dish whenever I buy fresh string beans. Thank you!